ConnId (Connectors for Identity Management) is built to help drive development of identity connectors, the technology layer that takes place in the exchange of identity-related information (password, attributes) between identity managers (as Apache Syncope) and identity repositories: LDAP directories, relational databases, and more. ConnId's main purpose is to build a new home for the Identity Connectors project, with all that is required nowadays for a modern Open Source project: Apache Maven driven build, mailing lists, wiki, issue tracker, continuous integration. Original code and its derivations are released under terms of CCDL 1.0. Connectors developed from scratch are released under terms of AL 2.0. What is ConnId meant for? 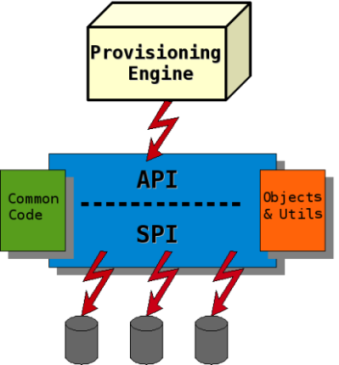 One of the main features of the framework is decoupling Connectors from any application that uses them. This means each Connector implementation can be easily replaced and not necessarily depend on a specific version of the framework. In addition an application may choose to use multiple Connectors which can require class path isolation. With class path isolation there is no issue with conflicting 3rd party libraries. An application is only required to couple to the Framework and not to any specific Connector. Syncope, Apache Syncope and the Apache Syncope logo are trademarks of The Apache Software Foundation.